Thank you all that visited our (sometimes very crowded) booth at the math show “Matematikbiennalen 2016”. Over 2500 math teachers and educators visited the show in Karlstad and we are very happy for the response we received for our math games. Space Math Hero was launched for both iOS and Android at the show and is our second math game. 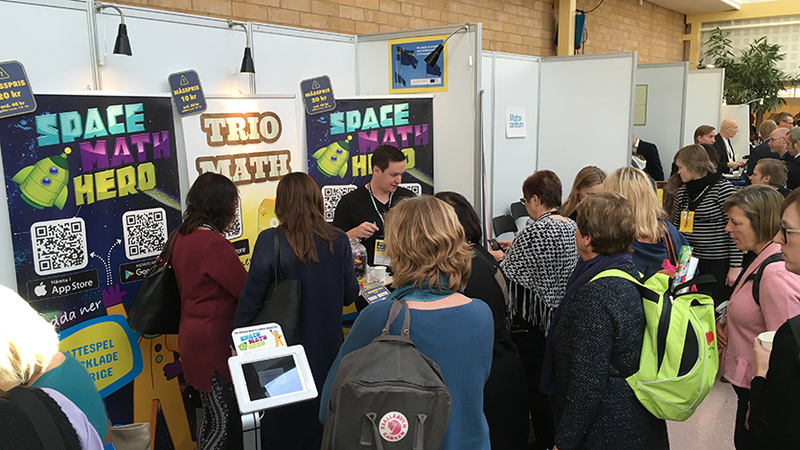 We also brought our first production, Trio Math, with us to show the range of our games dedicated to mathematics. We had a blast showing both games, met a lot of people and had fun conversations. Thank you all for visiting, making two days of standing up and hauling stuff across Sweden worth it! - This booth was the best part of the show! (Two teachers escaping from a “boring” lecture about gamification and math!). - Wow! This would be fun for our students to play. - I like how you can set the difficulty level for each player. - I can really see the whole class playing this on a big screen, rooting for each other. (About Trio Math playing five players at a time). - I need to get this for my kids! - I’m studying to become a Social Studies Teacher, I don’t need math. (Student walking by the booth). - Perfect mix of studying and fun. - You still got candy left! (Yes we brought a lot). - How do you hashtag SpaceMathHero? - Here is the money can I have my copy now. (Teacher handing over cash to get the game right away). If you want to know what the fuss is about: Space Math Hero and Trio Math.